Karhah Parshaad (Degh) made in Sarbloh utensils in accordance to Maryada. Historical and major Gurdwaras cook Prashad (holy offering) and Langar (holy meal) in Sarbloh utensils. This is a traditionally used utensil for cooking and for eating since the time of the early Sikh Gurus. Furthermore, the Panj Kakkaar (Sikh articles of faith) – the Karha and Kirpan – also have to be made of Sarbloh in accordance to the Sikh Rehat Maryada. ‘Sarbloh Bibek’ or the all iron quality is a strict Rehat (discipline) practised by strict Sikhs and Akali Nihangs. It is one of the paramount definitions of the Khalsa Panth and involves the consumption of edibles strictly from Sarbloh utensils. In Sikh tradition, Sarbloh (all-iron) is prized above other metals due to it being multi-functional and a scientifically beneficial element. It inhibits the food placed in it and adds minerals to it which not only nourish but strengthen the body. Often the historic Sikhs, who strictly paid adherence to this Rehat were described as having bodies like of rock. Eating from Sarbloh reminds one of their birthday every time they eat. The Sarbloh Baattaa they are eating from is the same Sarbloh which gave them life and made them reborn as the Khalsa. 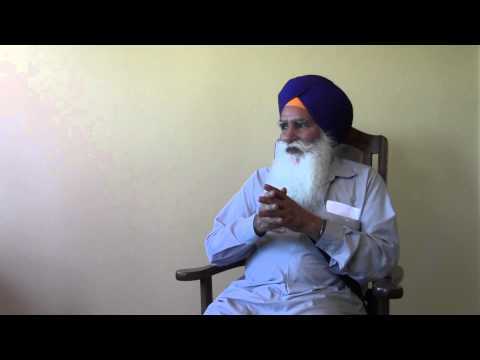 Groups like Damdami Taksaal, Nihung Dals, and Akhand Kirtani Jatha promote Sarbloh Rehat (discipline). If Sarbloh isn’t a Rehat, then why must Amrit Sanchaars be done using a Sarbloh baatta (bowl) and Khanda (double-edged sword) only? Isn’t this proof in itself? Who can do an Amrit Sanchaar in plastic bucket? No one! Only in Sarbloh. If one chooses not to follow Sarbloh Rehat, then it is up to them but the least they can do is not mock or belittle those Gursikhs who maintain such discipline. Puraatan (old) langars all made food in Sarbloh. Look at Sri Harmander Sahib (Amritsar) or Sri Hazoor Saahib: big Sarbloh cauldrons are still there today. If the Rehat of Sarbloh is not followed, does this mean it’s not a Rehat? Many in the Panth believed women didn’t need to wear kachheras until it was formally resolved in 1915. At the time when women didn’t wear kachheras, did it mean that it was not part of Rehat? A Sarbloh (iron) cauldron used for making Langar in a Gurdwara in India. ‘Sarblohi Singhs’ (Gursikhs who cook and eat out of iron utensils) will eat from a Langar that is prepared in Sarbloh made by Gursikhs who recite GurMantar or Gurbani whilst cooking, as per the puraatan (traditional) Rehit. If Langar is not prepared according to maryada (code of conduct), then they will not eat it. Is this so objectionable? Even the Langar in Sri Harimander Sahib has a sign outside saying only Amritdharis may prepare food there. If proper Langar maryada is followed, any Singh or Singhni and any ordinary person can eat there. American Sikhs visiting Amritsar in 1978, eating Langar in Sarbloh utensils. “Often in the need for modernization and appeal the discoveries and ingenuity of the ancestors are forgotten and man places his well-being straight into the fangs of death. Compared to aluminium, a substantial component of the utensil industry, iron does not possess any lethal effects to the health and has a far more beneficent effect than the nullified stainless steel, which is becoming extensively employed by many home-goods manufacturers. On a much perceptive scale however iron is famed, amongst the orthodox Sikhs, for it’s ability to retain vibration. Along with being a natural conductor, iron retains extensively high-pitched vibrations in it’s structure which according to spiritual scientists are passed onto it’s user. In simple terms this allows an orthodox Sikh to influence orthodoxy amongst his fellow Sikhs by feeding them in iron. Human emotions are obviously expressed via sound and as such the vibrations are retained by iron, an orthodox Sikh would surely recite non-specific passages from Gurbani and/or chant ‘Vaheguru’ which would birth the same spiritual emotions in a fellow Sikh; who would consume food from his hands in iron utensils. A great number of historical Sikh figures have followed ‘Sarbloh Bibek.’ They would strengthen their mind and exist in a high spiritual state where, despite remaining unaffected by the world, they heavily influenced particular events. Such Sikhs would only consume food cooked by themselves, by Sikhs on a similar spiritual level or forego the need for food unless their requirements were met. Among their ranks the names of Bhai Randhir Singh Ji, Sant Giani Gurbachan Singh Ji Khalsa Bhindranwale and Shaheed Akali Nihung Avtar Singh. These individuals were noted for their vitality, even in their senior years, and their exceptional stamina in the face of grudging odds. All credit for their physical and mental finesse lies with Gurbani, Rehat and ‘Sarbloh Bibek.’ Their lives are evident of how a supernatural sensitivity arises in orthodox individuals who are affected even by the slightest currents in the micro-organismic and/or spiritual prism. They gain the ability to retain and analyze the unspoken thoughts and intentions of their fellows. As such they will be heavily affected and tired out by the thoughts of egocentric individuals whose selfishness will not cease, thus they will avoid the company and items of such individuals. « What is ‘Dietary Bibek Rehit’ and why are some Sikhs strict about who prepares the food they eat? Gurmat Nihangs refers to Nihang Singhs who adhere and practice the Guru’s Teachings. In the past whenever heard about Nihang Singhs they had a positive impression of role model Gursikhs. However, nowadays Nihang Singh’s name and image has been tarnished by people wearing Nihang dress and being drunk on marijuana, eating meat, taking over people’s property and other anti-Gurmat practices. Fort this Gurmat Nihangs means those Nihang Singhs who still maintain the Guru’s Rehat (discipline) and live in accordance to Gurmat. Did sarbloh utensils helps to increase iron as well can somebody have any knowledge regarding that. Is rejecting langar made by a non Amrit Dhari Sikh who maybe striving to become a gursikh not good enough for all? I do not think Sri Guru Granth sahib ji would agree with this concept as it has no compassion in my view. If someone wishes to eat in an Iron dish for his/her personal reasons fine but rejecting langar from another is what i have an issue with. Put it this way if a Amrit Dhari Sikh is so powerful he would not be affected by food not made in an Iron dish because there is nothing more powerful than Sri Guru Granth Sahib Jis BANI. VJKK VJKF. Maryada is Maryada. With the logic you suggest, if an Amritdhari Sikh removed their Kashera and other Kakkars there would be no issue because Sri Guru Granth Sahib Ji is more powerful. Regarding compassion and respect of others. Respect and compassion doesn’t mean one compromises their principles and commitment made to the Guru. Does iron protect against black magic? Saw a video on youtube of a Singh in Kenya, someone tried to do black magic on him & was unsuccessful. Voo doo man shocked that his voo doo never worked approached Singh & revealed all, that he had been paid to do it & wanted to know why it didn’t work. When he saw Singhs Iron kara the voo doo man refered to it as the reason for his magic being unsuccessful.